"This is a light and garlicky spaghetti sauce. This is delicious and easy to prepare! A variation on the original garlic spaghetti. I like to serve it with a glass of red wine. My husband's favorite! Serve with a heated sourdough baguette and dip in 6 tablespoons olive oil and 2 tablespoons balsamic vinegar if desired." A super-simple spaghetti with garlic, red pepper flakes, and parsley. I loved it! Use more garlic and oregano than recommended. This was good but not much different from tossing spaghetti with just heated pasta sauce, especially garlic-flavored sauce. Great recipe. Easy, fast to make, tasty and cheap. Added a chilly in the sauce to spice it up and some cheese on top when served. Absolutely Delicious!!! I changed the recipe a llittle. I added kalmata olives and instead of 2 cans of tomato sauce, I used 1 can sauce and 1 can diced tomatoes. I really liked the flavor, I used small shell pasta instead of spaghetti, and added a little hot sauce and grated cheese. It was really pretty good. 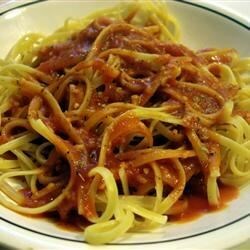 Quick easy spaghetti sauce. Nothing too fancy. I added a little sugar. The recipe turned out fine, but it was a lot of fuss for just some extra garlic. It's easy enough to just put a few garlic cloves in your pasta sauce and loads faster.